SPOILER ALERT: I encourage everyone to see this film without giving thought to reviews. It has so many treasures, and I wouldn't want to spoil that experience for anyone. If you'd like, you may want to skip to the bottom for a short explanation of the mature content in the film. Other than that, I encourage you to watch the film first, then come back to engage with this review. I'm at a loss for where to even begin this review. Paul Thomas Anderson and Daniel Day-Lewis are two of the most acclaimed artists in Hollywood, and many say their collaboration on There Will Be Blood is one of the best films of the last 25 years. They join together once again on Phantom Thread and I count it as my personal favorite film from either of their storied careers. Day-Lewis plays a London fashion designer named Reynolds Woodcock. To say Reynolds is a perfectionist and a workaholic would be a massive understatement. He is an expert designer, and he lives for his work. His work must be perfect. That is his life, and he is exacting in his vision. He is aided by his sister, Cyril (Lesley Manville). It is Cyril who sends off Reynolds' love interest who has the gall to question why he is so distant. The failure, Reynolds would have us believe, is not on the part of himself but rather on the part of a woman who would have the ludicrous assumption that a relationship with him meant anything more than to put up with his incredible idiosyncracies and unending need for control. However, the first person we meet in the film is someone whom we don't officially know at the beginning. We gather that she is participating in some type of interview. And it is she who describes Reynolds as the most demanding man - something that becomes readily apparent as the film continues. We officially meet this woman later, as Reynolds does, at a countryside restaurant where she is a waitress. She is unassuming at first, and Reynolds asks her to dinner. She obliges, and the film's narrative begins to take shape. The woman's name is Alma (Vicky Krieps), and she quickly catches Reynolds' attention. He decides to make her a dress. This leads to a scene where Reynolds is fitting her and taking her measurements. He and Cyril objectify her and speak into her own body insecurities. Yet Alma continues. Why - we wonder? Later, she tells us. She feels different when she is wearing his dresses. From there, Alma and Reynolds begin a relationship. This movie is about many things - perfectionism, the insufferable artist, male/female dynamics and even some Freudian psychology. But, more than anything, this film is about control. The way Reynolds and Alma jockey back and forth for control in their relationship is fascinating in one way. In another way, it is deeply disturbing. As the movie continues, you get the growing assumption that these are two deeply-hurt individuals. They are at various times creepy, tender, psychotic and compassionate. It is clear that their relationship is not healthy, and yet they may be each other's perfect companion. Maybe they deserve each other. There are times in the film where you might shudder to consider that. I will try to steer clear of any overt spoilers in this review, but I will say that there is a twist late in this film that may turn all your notions about their relationship upside down. ...I think Daniel Day-Lewis got out-acted in one particular scene. Reynolds and Alma are sitting down to dinner. It is a scenario that has been contrived by Alma to help them grow closer together. She wants control of the situation, but Reynolds is having none of it. They fight about asparagus. In this scene, Krieps is absolutely incredible. I'd give her the Best Actress Oscar for her work in this scene alone, but she does so much else throughout the film. Yet, these are not the only two performances worthy of note. Manville is fantastic as Cyril. She is cold, and she does Reynolds' bidding for most of the film. There are, however, a few moments where she stands up to him. Though he is the master and the artist behind their wealth, Cyril will not blindly fall before him. She, too, exerts control in her own ways. I've discussed the writing and direction of Anderson as well as the incredible acting performances from Krieps, Day-Lewis and Manville. However, I don't think I've even discussed my favorite part of the film yet. Jonny Greenwood's score is the perfect complement to what we see on screen. 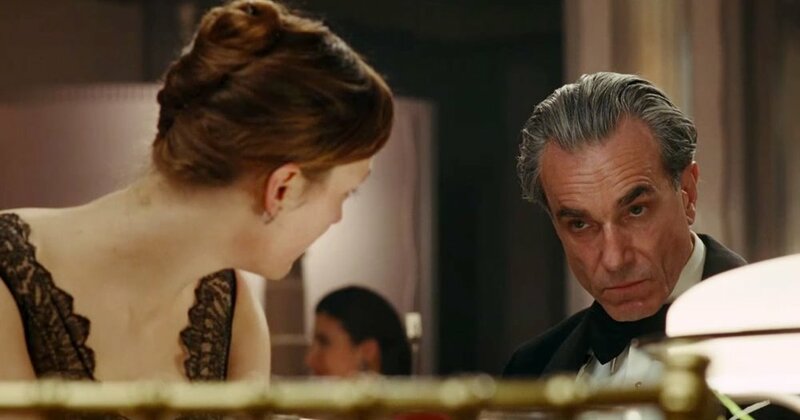 Just like the incredible costumes we see paraded before us throughout the film (Phantom Thread is a lock for the Costume Design Oscar), the film's score is sumptuous at all times. But then it weaves in haunting notes. It rises and falls and calls to us with the faintest pluck of a harp or the soft movement of piano keys. After being wowed by the score for Blade Runner 2049, I did not think any film score of 2017 would overtake it as my favorite. I was wrong. This film is also incredibly funny at times despite some of its darker themes. It is a difficult movie to describe. There's just so much in it. I've only seen this film one time but, unlike my feeling after watching There Will Be Blood, I only want to see this film more. I think I will find more in it with each repeat viewing. And between the beautiful costumes, the fascinating script, the incredible acting and the luxurious score, this film has so much to love. Come back to me in a couple weeks and ask me if I've stopped thinking about Phantom Thread. My guess is that I’ll answer that I haven’t. Note on content: This film depicts an incredibly-controlling man and some unsettling scenes result from that. There are multiple instances where Reynolds objectifies or talks down to the women around him. Characters use profanity, and there is one scene when Alma is being fitted for a dress where her breasts are visible through her undergarment. It is a haunting, dark, dramatic film. However, it has far less mature content than many modern R-rated films. Its darkness is more cerebral - forcing you to consider the personalities and relationships you see on the screen.